A Random Access Memory (usually know by its acronym, RAM) is a form of computer data storage. Operating System is an interface between hardware and user, it is responsible for the management and coordination of activities and the sharing of the limited resources of the computer. Internet is a global network connecting millions of computers. Www means World Wide Web. Html means hypertext markup language. 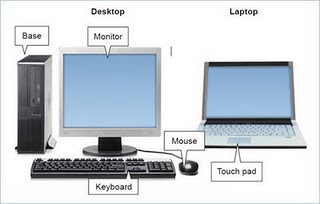 Mouse is a device that controls the movement of the cursor or pointer on a display messages. Keyboard is a set of typewriter-like keys that enables you to put or enter data into a computer. PHP Programming Language commonly known as Hypertext Preprocessor. Mozilla Firefox, Internet Explorer and Google Chrome are examples of browsers. VoIP means voice over internet protocol. Windows Vista, Windows XP and Red Hat are examples of operating system. CD ROM is a Read Only Memory. USB Means Universal Serial Bus. Modem means modulator/demodulator. It is a device that converts analog signal from providers line into digital signal that goes out going to our Ethernet card.